Soon after establishing the Metta Development Foundation (Metta) in the 1990s, I visited the Philippines to study the Farmer Field School (FFS) programme. It proved to be a very fruitful visit as my FFS studies formed the basis for Metta’s work of coordinating ethnic groups that have reached ceasefire agreements with the government and faith-based groups to participate in development programmes for farmers and communities in their areas. The social integration of former soldiers, representatives of faith traditions and farmers provide a strong platform for community cohesion, contributing to peace and economic prosperity for the respective communities. Faith-based groups have been the mainstay for destitute and desperate communities throughout all the years of conflict. And more often than not, armed groups have had to rely on farmers as their main source of food. At the same time, it was determined from the outset that Metta would be an independent non-governmental organization (NGO) that would work with all peoples and faiths. Candidates selected by ceasefire groups and community-based organizations (CBOs) are trained as FFS facilitators. Former soldiers turned facilitators now come to the field and work alongside their previous benefactors – the farmers – showing them how to achieve greater control over the conditions they face daily in their fields. At harvest time, each field school organises a Field Day and invites local authorities, village elders and nearby villagers to witness the achievements of the field school and its participants – the farmers. Civil authorities and military representatives witness how the Farmer Field Schools have brought farmers and villagers together, and how they can strengthen village institutions and civil society at the village level around the practical issue of farming with measurable results of increased yields. Another rebuilding tool used in Metta’s fieldwork is Participatory Action Research (PAR). PAR provides communities with the means to identify their resources and needs. Projects based on the outcome of such analyses are known as PAR projects. These are generally small-scale and related to the priorities of the local villagers as set by themselves in the process. The participating families themselves choose management committee members, which also provide the project local credibility. These families are fully involved in all stages of implementation, creating transparency and accountability. In the process, the members are encouraged to become decision-makers. Metta provides the appropriate skills training necessary for the successful outcome of the project. 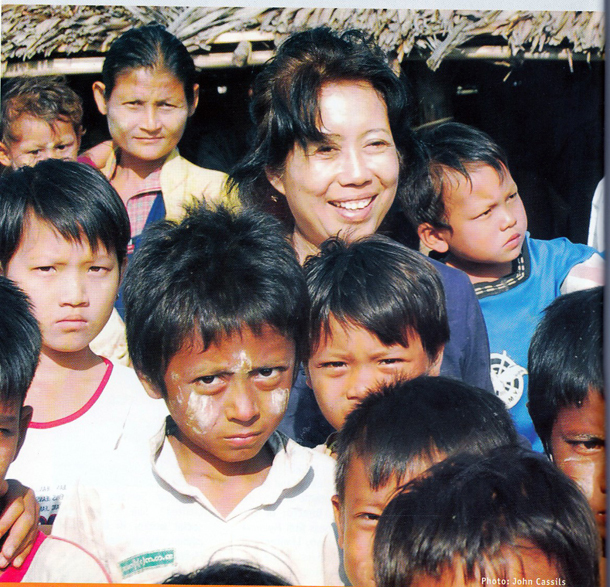 Following Cyclone Nargis in 2008, which devastated large areas of the Irrawaddy Delta, ethnic Kachin and PaO facilitators left their homes in the borderlands to introduce FFS in the delta area, forging partnerships across geographic and cultural boundaries. The degree of experience and cooperation built up among project participants during this period is such that Metta’s post-tsunami Area Coordinator became the Chairman of the Nargis relief work for 13 villages in Dedukone district in the Irrawaddy Delta. Some of the FFS Area Coordinators and farmer leaders have also become elected village heads in other areas where Metta runs programmes. As we have learned through such experiences, the most rewarding outcome of both the FFS and PAR projects has been the emergence of local community-based organisations that have gone on to take up other development initiatives. I am therefore particularly pleased that the Magsaysay Foundation highlighted Metta’s work in empowering communities and supporting local organizations. Our vision has always been based on these two principles, which we believe are the foundations for a new society in Myanmar. This new society is very alert and active today, and local organizations and communities are playing a vital role in efforts to regenerate our country. Of course, from time to time we have encountered constraints in the operational context in such problem areas as registration with different stakeholders, a limited availability of funds and a focus by donors on short-term service delivery projects that limit the time and resources available to local organisations for institutional capacity-building. All these factors reduce the opportunities for smaller scale “next layer” organisations and thus limit opportunities for wider civil society strengthening. In Metta’s work, “strengthening civil society” means the flourishing and effective delivery of NGO-CBO groups. This does not need to be a particular end goal but simply the meeting of needs and challenges that will ultimately help the strengthening of communities, society and country. For too many years in a country divided by conflict and under-achievement, the opportunity for “strengthening civil society” has not been as realistic a goal to achieve as it is in the present moment of political transition in Myanmar. Although not the only element, the role of civil society is vital in the processes of societal development and transition. On a wet grey day in April 1990, I witnessed 27 young men joining the Kachin Independence Organisation (KIO) and took a photo of them. All these years I have wondered what had happened to them in the intervening years. Questions have often haunted me, such as: Where are they? What are their aspirations today? Their regrets and hopes? Then, this June I unexpectedly met up with four of them. We discussed their vision for civilian life when peace eventually comes. They all said that they wish for a small piece of arable land to work on, to be independent and to be able to provide for their families. All four emphasized that they did not want to be an added burden to their wives who have carried the burden of supporting their families during all these years of suffering and conflict. Needless to say, peace agreements cannot endure unless demobilized soldiers from all sides find worthwhile livelihood opportunities to reintegrate them into society and help support their families and communities. In our country, educational opportunities for our young people have been overlooked for much too long. I am proud to say that the young people whom I had helped to receive non-formal education opportunities in neighbouring countries when I was working at the Representative Office of Kachin Affairs in Bangkok in the 1990s have returned to their communities and are serving them. But these are only a few instances compared to the needs of all the rural youth with very limited or no opportunities to attain life skills or a vocational education in our country. I hope therefore that, with the growth of the civil society sector, more opportunities may open up with short training courses in such subjects as management, healthcare, agriculture, early childhood care, development and livelihood skills. Let me share a story of an extra ordinary young man with you. In 1988 Naw Ja, a young high school drop-out from a conflict-torn area, was offered the opportunity to study in India through the scholarship programme I was coordinating from Bangkok. He ended up staying in India until 1994, completing one and a half years of distance education through the Indira Gandhi University, followed by 10 months of vocational training in agriculture. This was a turning point in his life because he discovered a passion for agriculture, and by 2000 he was involved in the first Metta FFS Training of Trainers programme. He then coordinated over 1,000 Farmer Fields Schools and became the manager of Metta’s training and research centre. Subsequently, between 2009 and 2010, he was awarded a scholarship and obtained a Bachelor degree in development studies from Kimmage Development Studies Centre in Ireland. He is now one of four leaders taking over the reins of Metta after my retirement. There are many young people in the same situation as Naw Ja, who could contribute in a significant way to the peace and long-term development of the country, if only they are given the right opportunity. Now is an especially important time in Myanmar. I do believe that there are positives in many of the changes presently underway in our country. But, unfortunately, I need to point our that there have also been setbacks in the Kachin and northern Shan states and other parts of the country, including the Rakhine state. In particular, over the years the Metta Development Foundation and local communities had been involved in helping rehabilitate and resettle some 450 villages in the northern Shan and Kachin states following the KIO ceasefire with the government in 1994. However 70 of these villages are now deserted, with many burnt to the ground, as the ceasefire with Kachin was not sustained. After 17 years, fighting resumed in June 2011 with the result that Kachin villagers fleeing the conflict now make up a population of 100,000 internally-displaced persons in the Kachin state and northern Shan. As a result, following decades of conflict, there are presently over half a million refugees and internally displaced persons around Myanmar, and their health and humanitarian needs are immense – as with all vulnerable populations in our country. This cycle of displacement and resettlement has yet to be permanently broken. Myanmar has so many lessons to learn from the legacies of political failure, internal conflict and failed ceasefires during past decades. Without lasting peace, there can be no real advancement. Urgent and strategic attention is therefore needed if the failures of the past are not to be repeated. Experience has taught us that ceasefires alone will not be enough to initiate political transformation on the scale that is needed. I am thus encouraged during the present time of political transition by community, ethnic, military, national and government leaders all expressing their willingness to engage in dialogue to find lasting solutions for peaceful co-existence and harmony among peoples of different backgrounds. I do believe that the current political system can be reformed to bring true democracy and ethnic peace. But, without solidarity, advocacy and understanding, little will change. On this basis, I trust that the Magsaysay award, conferred to me at this crucial period in our nation’s history, will help draw national and international attention to the ongoing efforts to find lasting solutions for genuine peace. And I will continue to be involved, wherever possible, in coordinating efforts to resolve the underlying political grievances of the ethnic nationalities and ensure that the voices of the common people are heard in the ongoing, peaceful transformation process. On this occasion, I therefore wish to pay tribute to my many colleagues, friends, family and partners at home and abroad, especially those in the conflict-afflicted and suffering regions of our country. For many years we have worked alongside each other in the most isolated and neglected areas of Myanmar, with such impoverished people as former refugees, internally displaced persons and those adversely affected by poppy cultivation and abuse. We have also lent our support to communities devastated by natural disasters, including Cyclone Nargis and Cyclone Giri, that brought such tragedy to so many people. Through our work, we have striven to bring to the forefront the complexities of the humanitarian and socio-political challenges that the peoples of Myanmar face and the rewards of partnership and cooperation. Let us now build on these past experiences, and continue to work harder to set standards for future generations to emulate. I know that my decision to pledge my prize money towards projects that will protect the Myitsone area in northern Myanmar and provide sustainable livelihood opportunities for local communities will not come as a surprise nor meet with your disapproval because it is in keeping with our commitment to work with the poor and the disadvantaged people. To my new friends, Myitsone refers to the confluence area in the Kachin state where two rivers converge to form the Irrawaddy River that flows through Myanmar as the lifeblood of the nation. Myitsone is the heart and soul of the Kachin people; Kachin history and culture are richly entwined with it. Moreover, the Irrawaddy River is the common thread that binds together the citizens of the Union – from its source in the far north, along its path through the central plains and the delta region, before it flows into the Andaman Sea. As a popular Myanmar saying goes, the Irrawaddy is like “a mother who feeds all Myanmar’s citizens”. Today the area is under threat from a dam project that poses grave dangers to its delicate eco-system, its cultural and religious heritage sites, and its communities, who could be displaced and deprived of their lands and livelihoods. The dam project was suspended under Presidential orders in 2011, but there are indications that the resumption of construction could be imminent. I am, therefore, most grateful to the Magsaysay Foundation for providing me not only with the opportunity to help protect Myitsone though the prize money but also a powerful forum to publicize the need for transparent and ethical processes that truly address economic and environmental issues to the benefit of the local communities and nation. Of course, after decades of strife, the peoples of Myanmar want livelihood progress and social development. But, in a land of abundant human and natural resource potential, it is also vital that new projects are appropriate, sustainable and in consultation with the local peoples. The mistakes of the past should not be repeated. Finally, because Myanmar is relatively new and unfamiliar to much of the international community, I would like to take this opportunity to urge international donors and agencies to learn from the experiences of the past and to subscribe to the principles of empowering communities and working with local organisations while in Myanmar. Future progress and national stability will depend on it. My fervent hope is that peace will prevail, all displaced persons return home appropriate development bloom evenly, and that the Irrawaddy will continue to flow for all time. I pray that achieving these goals can help unite all the citizens of Myanmar and build a lasting peace for future generations. There is no time to lose.